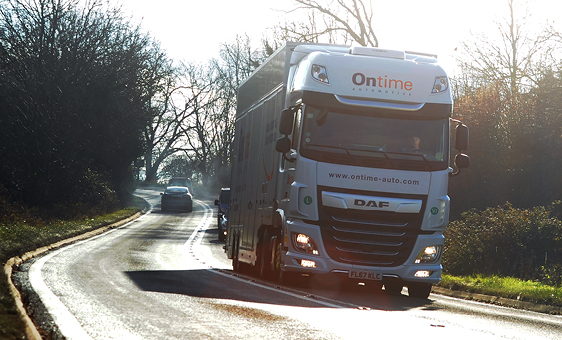 Ontime’s luxury car transporters are the way to get classic cars and sports cars transported to their destination at any time of year, without clocking up unnecessary mileage or exposing them to public road conditions. But the winter months make luxury car transporters even more useful than they usually are, with extra risks out on the roads that a classic car transporter is designed to protect against. Here are five of the best reasons to use luxury car transporters in winter, to get your pride and joy from A to B in pristine condition. Wintry weather conditions range from heavy rain, strong winds, icy roads and snowfall, to the impaired visibility caused by a lower sun reflecting from wet road surfaces – all of which can put you at risk when driving a sports car that is designed more for track conditions. An enclosed car transporter means not only do you not face those threats as a driver, you also don’t expose your vehicle to them – leaving it safely cocooned from wet and windy weather for the duration of its trip. All of the kinds of conditions mentioned above are made even worse by facing them on unfamiliar foreign roads, where you might also be adjusting to driving on the other side of the road – and again, the restricted visibility of some sports cars makes it even harder to adapt to an unusual road position. Our enclosed sports car transporters ship your vehicle from A to B without you having to drive it there yourself, and all of our own drivers are suitably experienced at international car transport and driving across borders. From the new registration plate in September to motorists treating themselves and their families for Christmas or as a New Year’s resolution to drive a better car, the winter has several times when you might be more likely to invest in a brand new luxury car. You probably don’t want your first experience of driving it to be the way home from the factory or forecourt, but our luxury car transporters can get it to where you want it, without adding extra miles to the clock, so you still get that experience of being its first driver on the open road, but in a time and place that suits you. We make sure we’re always here if you want to check on your vehicle’s progress, with 24/7 contact throughout the year, including during the winter months when it can be more likely that part of your vehicle’s transport will take place in darkness. All of our luxury car transporters are tracked from dispatch to destination, so there’s no risk of your vehicle taking an unscheduled diversion along the way – just total visibility and peace of mind. You want to know that your classic car will be driveable when it reaches its destination, and thanks to our onboard battery chargers, any battery handed over to us in healthy condition should still be juiced up on arrival, even over long distances or in extremely cold winter weather. Meanwhile, if you break down away from home due to the cold, our classic car transporters can pick you up – with equipment to load non-starter vehicles without any further bodywork damage – and safely return you home, even repatriating broken-down cars from elsewhere in Europe and the world.